I learn by mistakes, usually after the second or third one! A year and a half ago my banana plant produced a stalk of bananas and I had no clue why. I also learn via research. The internet said, if I take care of the plants they may produce by design rather than by accident. It is 10-15 month cycle for the plant to bear, they won’t produce well if crowded and they like to be fed. I am using fish emulsion and regular doses of my compost. The results for this season, have been two full stalks of the Burro banana and three of the Manzano. The dead or damaged leaves are now used for a layer of mulch/weed barrier. In some parts of Mexico the leaves are used to wrap tamales rather than using corn husks. I recieved a call about some “free” bees in a TALL pine tree and my Goo friend John and I checked them out. They are 30 plus feet up in a the tree with multiple openings in a long split in the trunk. It will be a real challenge. Not sure I am the man for the job. While looking over the yard I noticed a banana plant, a Burro banana plant, with a very nice stalk of nature bananas. Located behind that plant is what looks like a Manzano plant with a stalk developing. Wow! 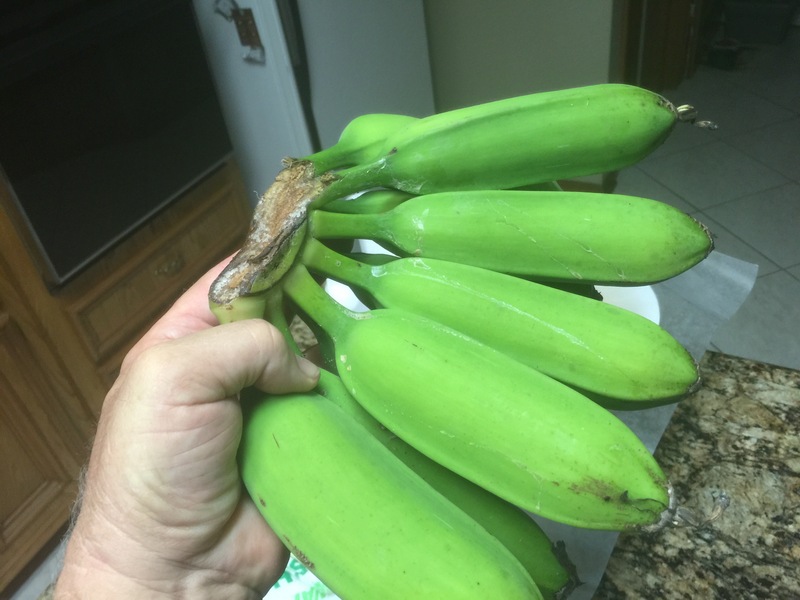 So, I gave a lesson and cut a nice big hand of bananas for the home owners. I will definitely have to follow up. Here is a photo of a recently cut hand from my plant that is identical to the one I cut at the homeowner’s house. From the photo you can definitely see where the term “chunky banana” comes from. Earlier in the day we went by one of my hives in the backyard of a friend. This is an 8 frame garden hive, two deeps and two medium supers, started from a package during the second week of April. This colony just exploded. Must be a great Queen and on top of that, a great location. 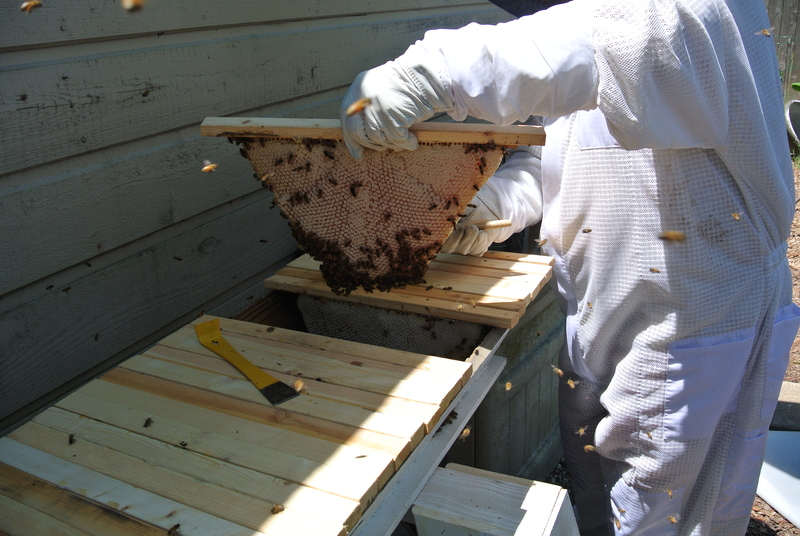 The plan for the visit was the remove excess frames, consolidate and ready the hive for the remainder of the summer. Well, the hive was over flowing and chock full. The result was 40 pounds of honey and we still left them with plenty. Added some hive beetle traps and closed them up. One of my garden hives pictured above from earlier in the spring. Just two deep boxes and no supers. Top bar hive in the background. Now, a day later, FYI, this is taking me three days to jot down, I need to visit my top bar hives and another set of garden hives before I run off on my Californua adventure. 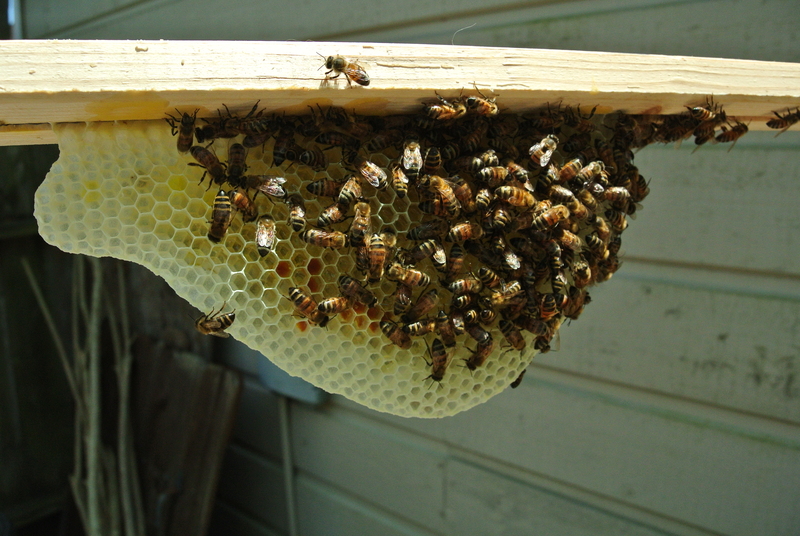 I was just reminded that I need to organize and clean up my hive work site – yes dear! Unpacked the 16 box shipment today that arrived at the front door on Monday…..while I was traveling. In hindsight, I should have given my bride a heads up but…… Lumps look good on my head! UPS was very helpful. 16 boxes of what you are probably wondering! Even if you aren’t, I am going to tell you!!!!! Once opened they represent four, 8-frame garden hives. I will be adding two supers to each once the nectar flow starts. 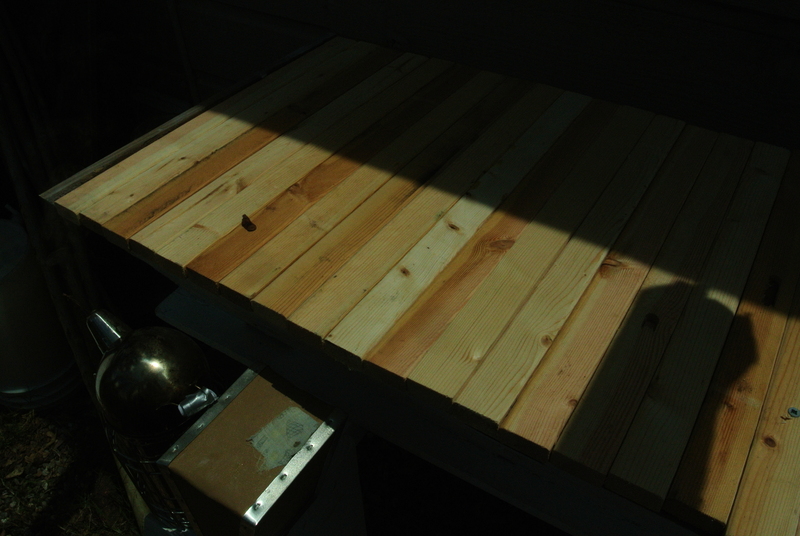 I am building a couple more top bar hives and several more Langstroth hives over the winter. I will see how I handle that level of activity before stepping out and adding any more for the 2017 season. Assembled and ready to finish. I am considering a natural finish but also like the idea of some soft pastel colors that blend with the backyard. I have one and possibly two more spoken for and looking for a home for the fourth. Wish my neighbor was not such a Grinch! One of my top bar hives I set up to receive bees from a downed tree. The rescue was successful! The cone shaped wire screen outlet was pointed toward the hive opening off the open end of the log. Last inspection showed capped brood and eggs being layed. This one and my other top bar were built with “junk” wood lying about my yard. Will build two more full size top bar hives and two half hives for swarm capture or rescue operations. 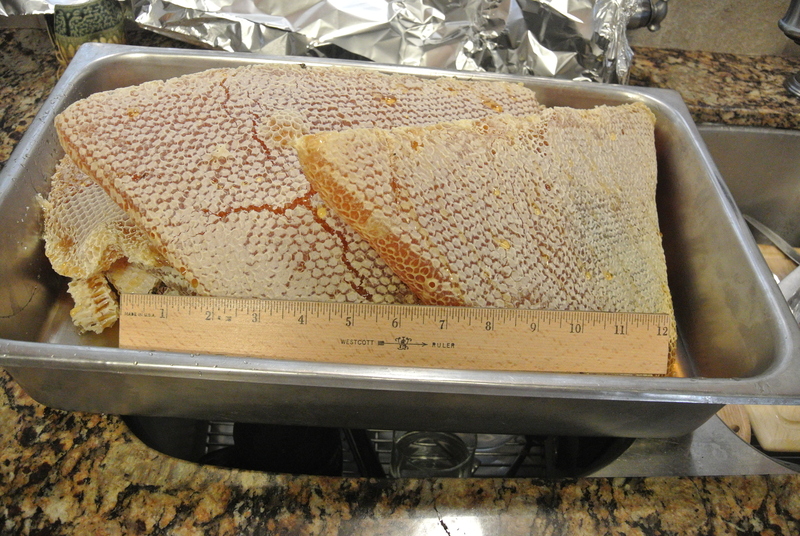 A 16 inch wide slab of honeycomb from my top bar hive. So yummy! Sad story….Possibly, immediately after this last harvest the whole hive left….sometimes the old queen leaves and the hive has produced a new queen – but I wasn’t so lucky. When I got back into it a few days later the robber bees were having a field day. 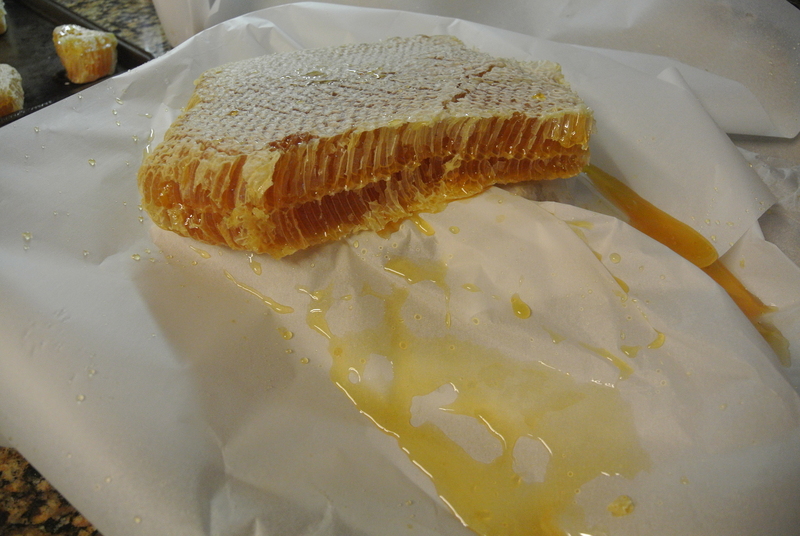 I salvaged some more honey but haven’t squeezed it yet….more on squeezing later. 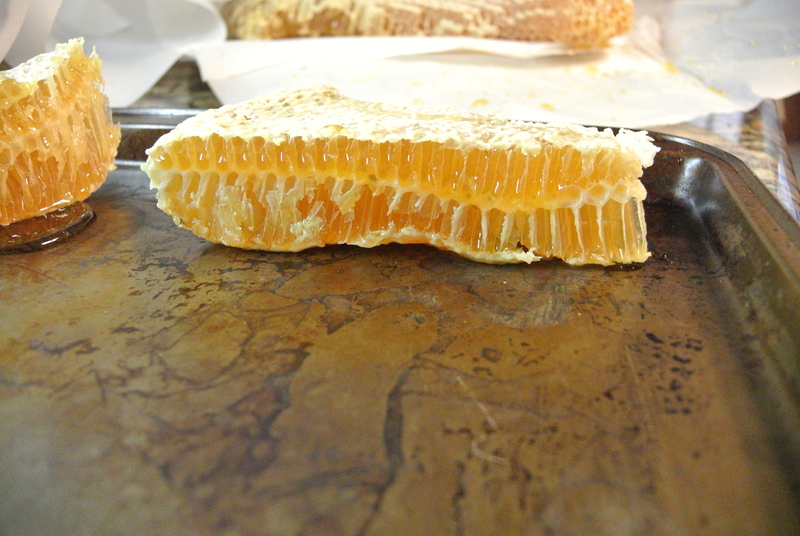 A nice capped section of honeycomb ready to be cut off the bar. My XXL gloved hand should give some perspective. I am still looking for XXXL gloves……fat hand, fat fingers and many, many auto-correct errors on my iPhone….that is a subject for another blog. 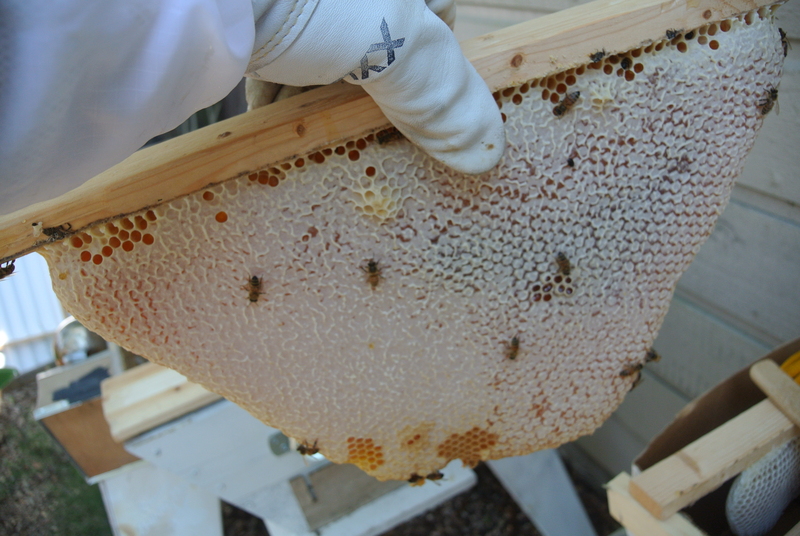 I am always amazed at how the bees draw comb….almost artistic in form and construction. The comb above was not finished so it was shuffled around with the ones that I cut and replaced. 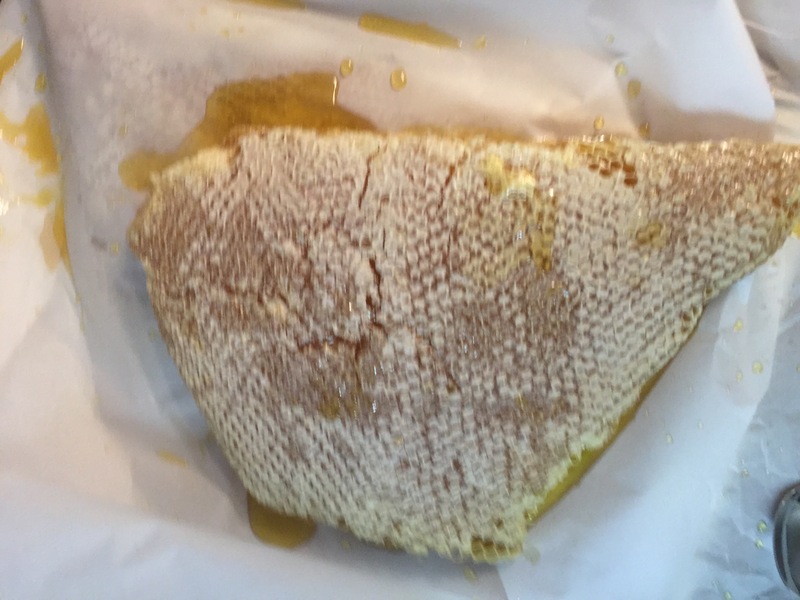 A nice pan full of lovely honey comb. It was a heavy haul. 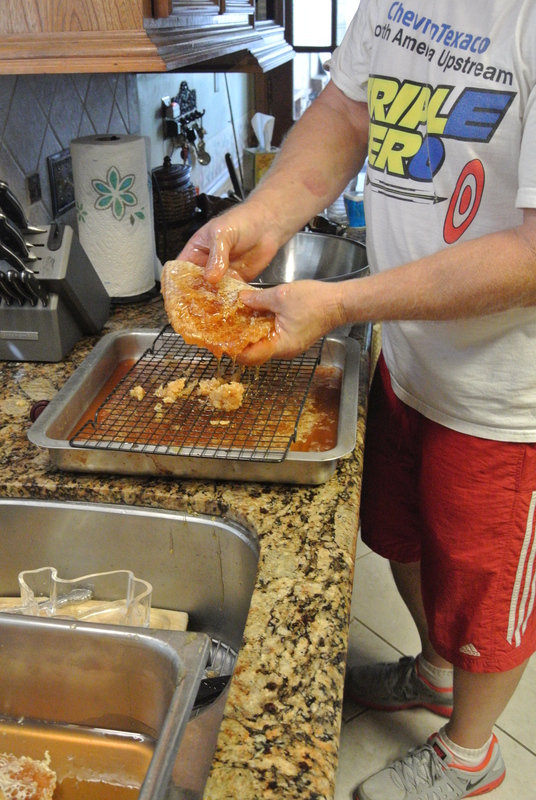 The squeezing process over a wire rack to catch the big chunks of wax as it drips through into a roasting pan. Pouring off the honey and wax bits into the pail. There is a fine sieve screen that sits on the top of the pail to catch the small stuff. Temptation….I was behaving but my wife and photographer snatched a few chunks of the delectable honeycomb for her snack. 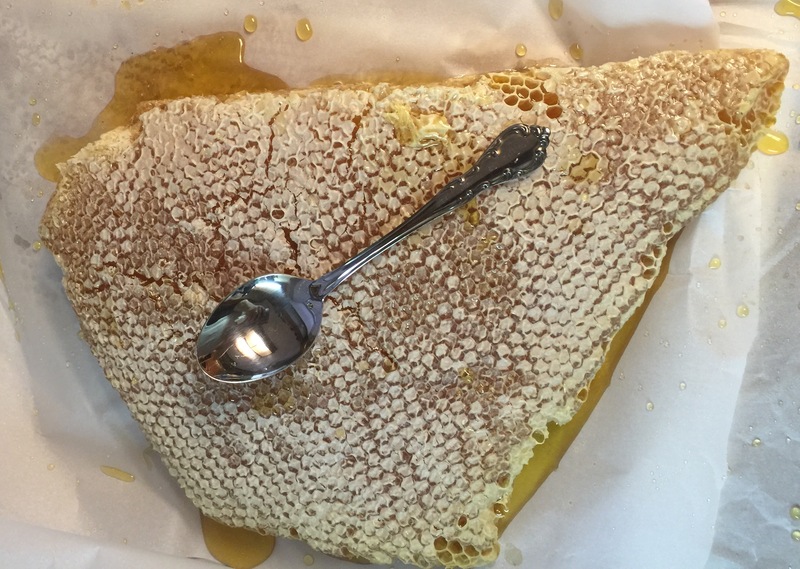 One of our customers refers to the cut honeycomb as addictive…..It really is better than candy! A hitchhiker from the hive area into the kitchen….This was one of 5 or 6 that we gathered up and escorted out to the backyard. The second load from the roasting pan off into the pail for straining. The wax is very evident on this shot. 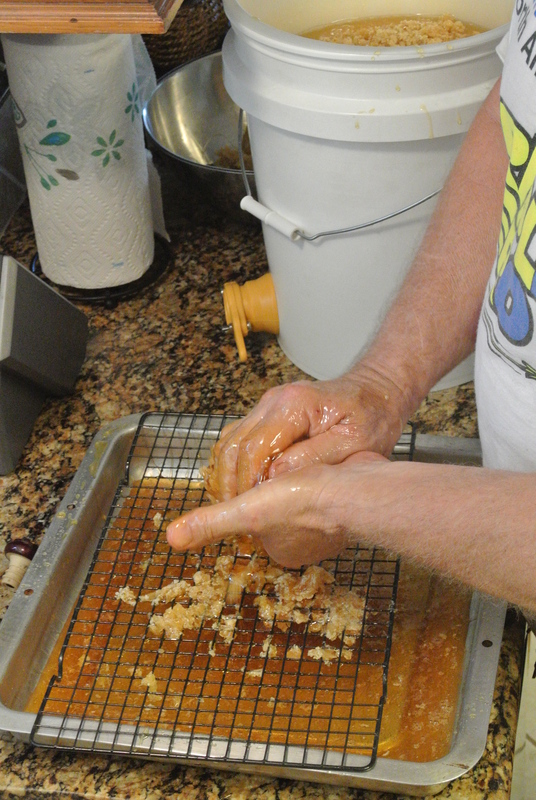 Here is a shot of me squeezing the honey from the wax. I would squeeze and compact the was as tight as I could. 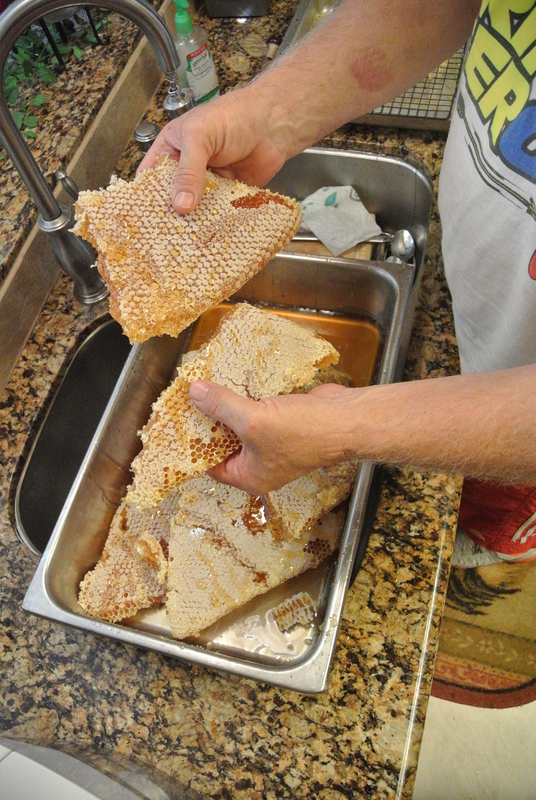 I then place it out near the hive and the next several days it is wild watching the bees from the neighborhood cleaning the wax. 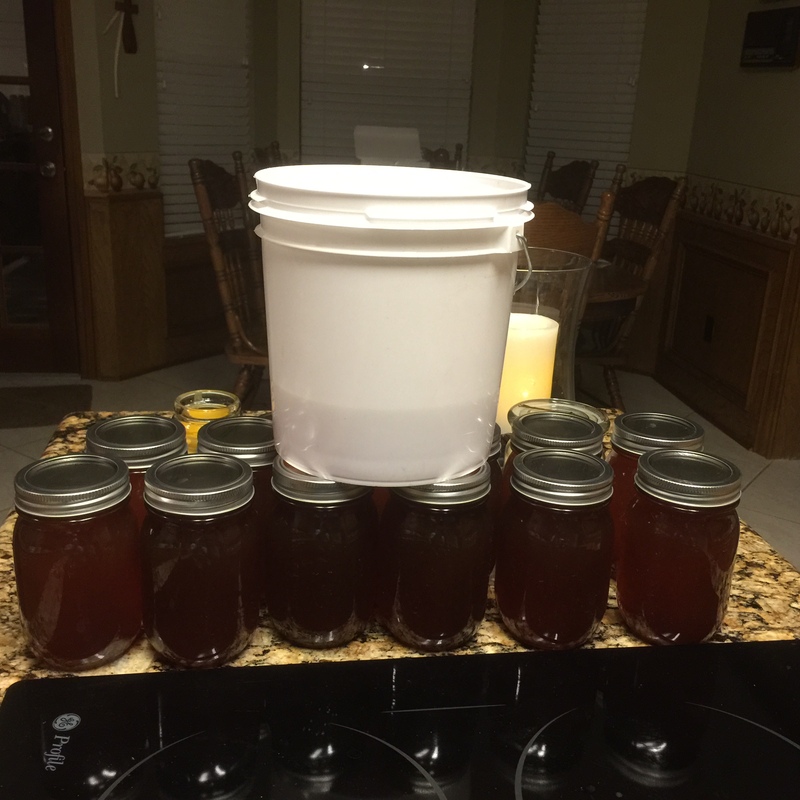 12 pint jars – 18 pounds of honey and a little over 3 pounds in the white bucket. So danged good. 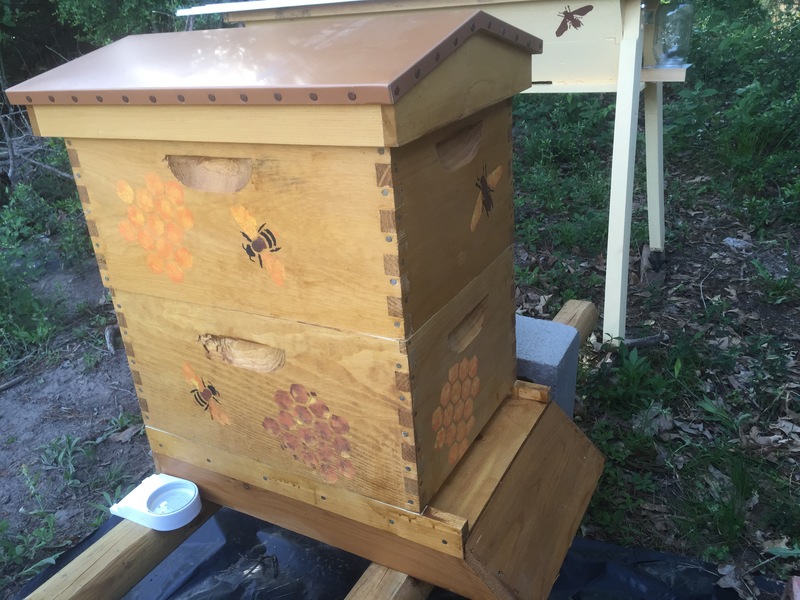 I think my other empty top bar hive may become a home for some swarming bees….I put some lemon grass oil in the hive and lots of bees are coming and going. it would be too funny if I recapture my bees! Yum, Yum, Yum……I pulled 3 bars with huge slabs of beautiful fully capped honeycomb 20 minutes ago and I was totally amazed. I cut up and saved 20 3X3 inch chunks, had a few to snack on and have a freezer bag full of odd sized pieces. Yum! Getting ready to cut them lose. My son Joe suited up and gave me a hand. Thanks Joe. 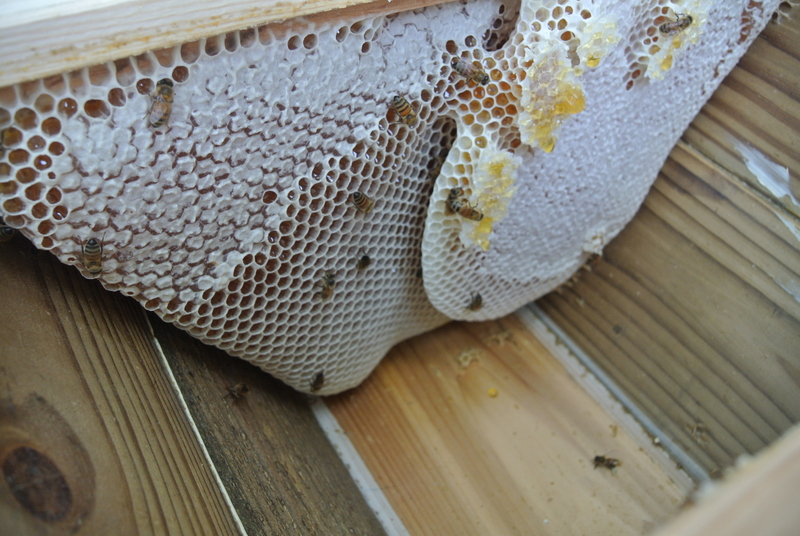 The combs pulled on the top bar hive are much thicker than those in my Langstroth hive. The broken pieces are so good to snack on! 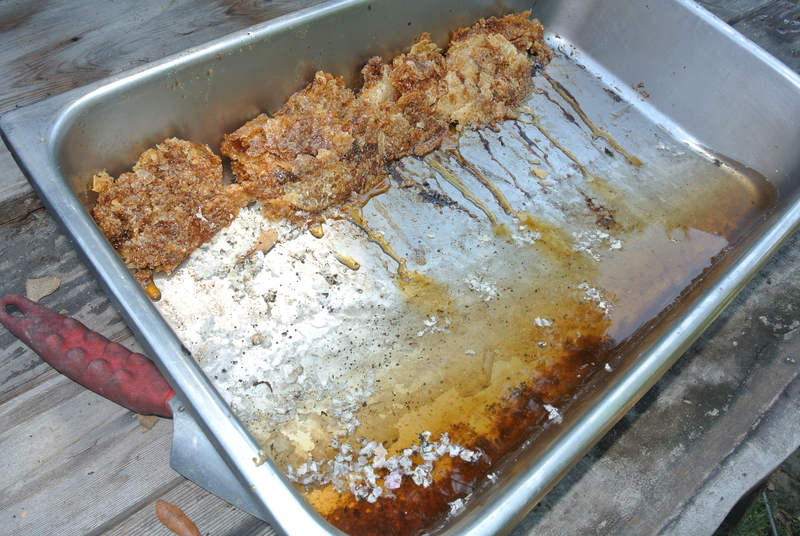 I separated the slabs with parchment paper….they caught the drippings pretty well but I was sure tempted to lick them clean….I resisted! 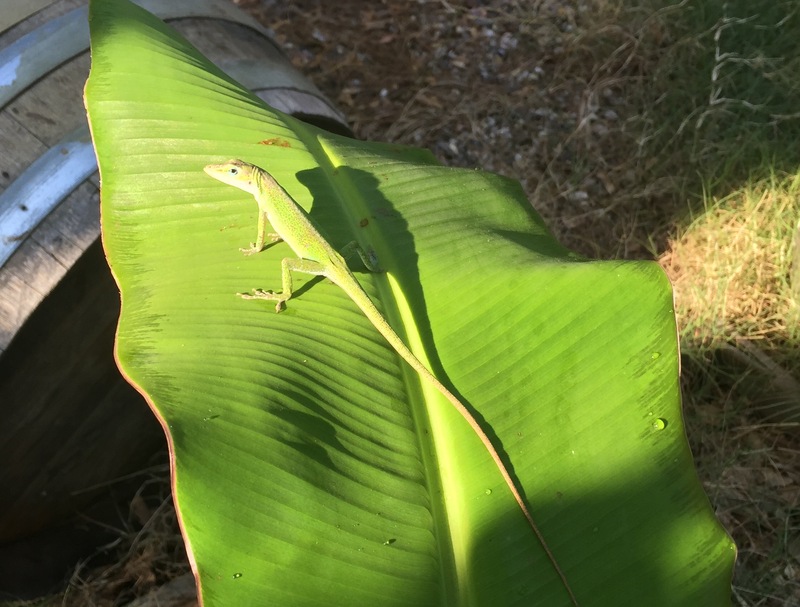 I caught a shot of one of my bug catchers hanging out on a banana leaf with my iPhone the day before….They are so good looking. More Top Bar adventures soon! The garden is still producing but not like in years past. The saving grace have been the cucumbers….Can’t give them away fast enough! The tomatoes are just pitiful looking specimens…..Oh, I pick a stray cherry tomato now and then but that is about it. The other success story is one of the banana varieties. I cut the stalk just below the female flowers after the plant switched to producing only male flowers. Those female flowers are developing nicely….time will tell. 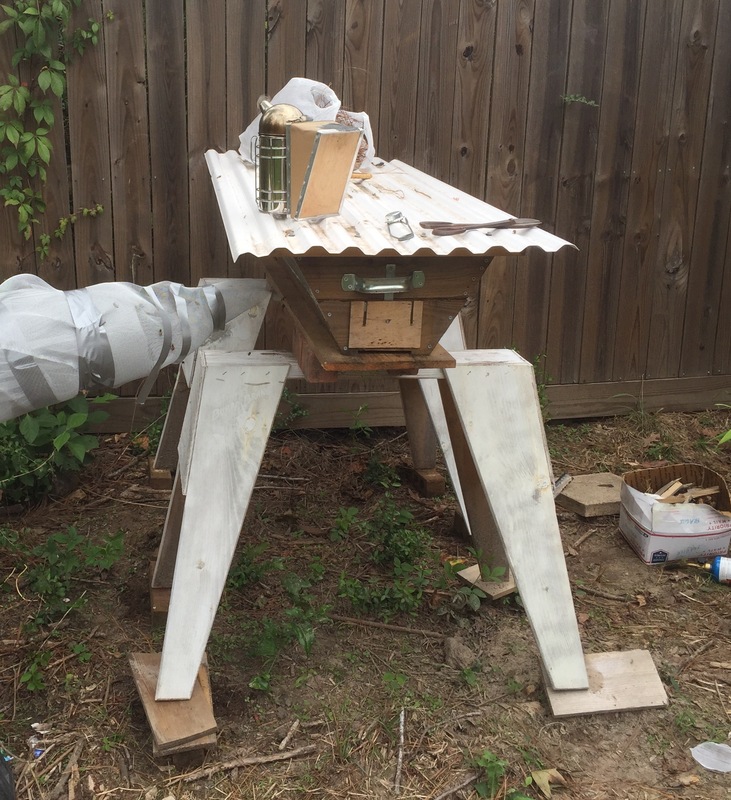 I have a bee problem now…..a neighbor that has not been easy to get along with discovered my bee hive during a recent fence repair and filed a complaint. Almost 18 months with no issue but…….The HOA does not forbid bees but apparently there is a provision that if a resident “needs” protection from harm, i.e., bees, then I am the bad guy. They bees need a new home, far away from my yard. The neighbor directly behind me is fully supportive of my bee keeping efforts. My neighbor to the east is a friend and fully supportive. The wicked witch to the West is the problem. Well, no honey for her! I have harvested about 8 gallons (about 90 pounds) from one hive and should have another good harvest just before fall. My top bar hive is getting full. 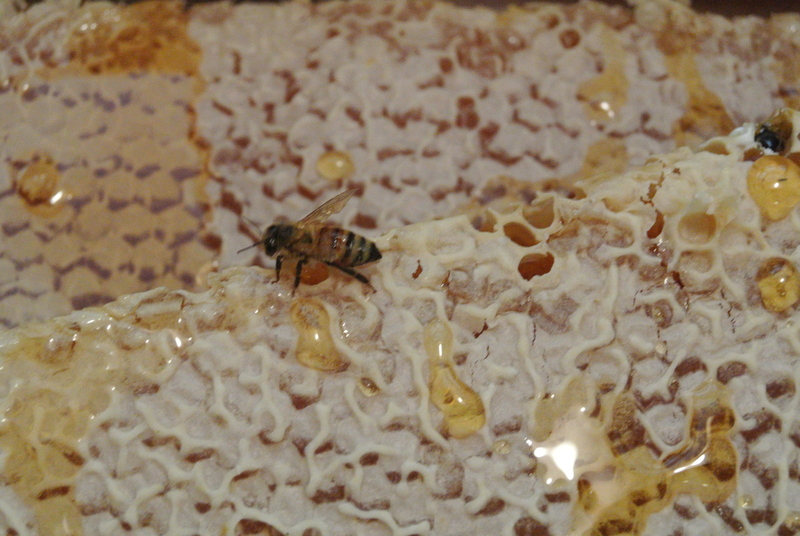 Tomorrow I am drafting my wife to give me a hand pulling some honeycomb and honey for my first harvest from this hive. It is a very healthy and strong hive. I am anxious to have it open tomorrow and show my wife how they build the comb and organize the activities inside the hive. 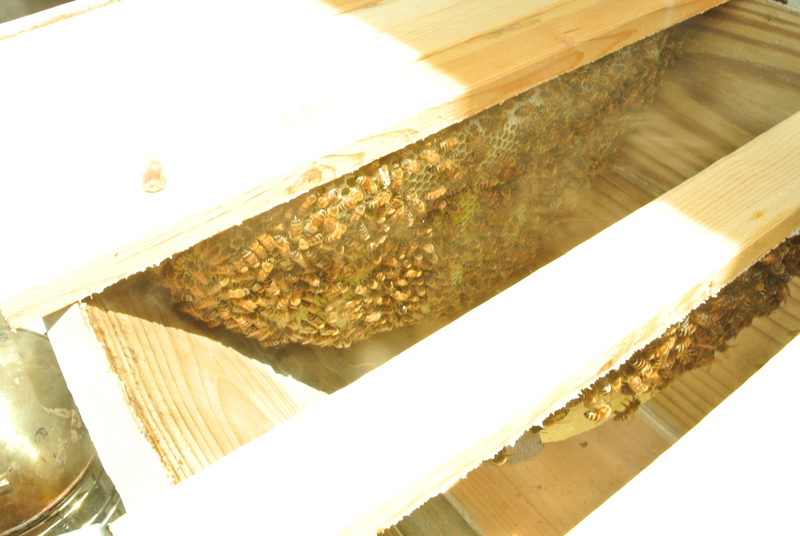 Nearly full width comb and deep into the box. We should see many, many more tomorrow. 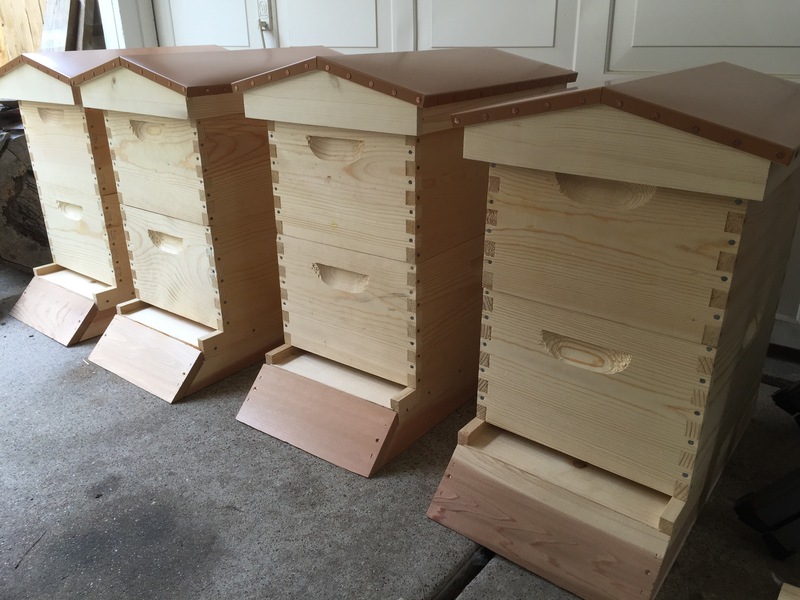 In two days I will move two of my hives to a farm, a little further than I wanted, but, I have a very interested woman that has been wanting bees. So off they go, both the large Langstroth hive and my top bar hive. 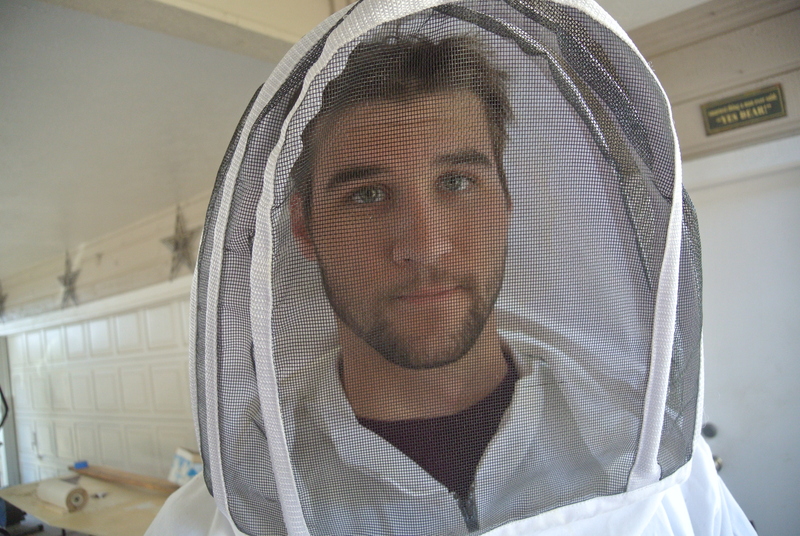 I retain ownership but, will have to travel to manage the hives. 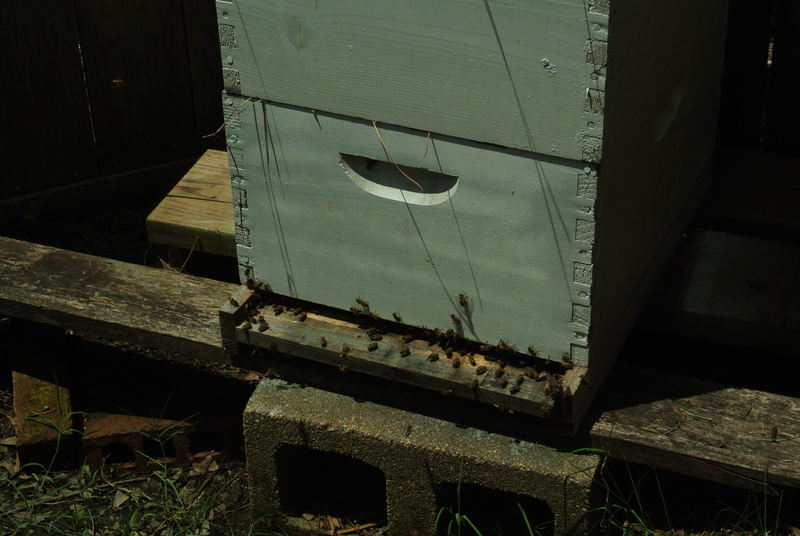 The second top bar hive was not to the bees liking when I installed them in May. They swarmed and moved off. Over the last few days there has been a small football sized mass of bees under some boards in the corner of my garden….they are now in my second top bar hive……I will see if I can keep it from scrutiny until it grows to the point that I can move it. Took the cappings’ from today’s extraction of 6 medium frames. 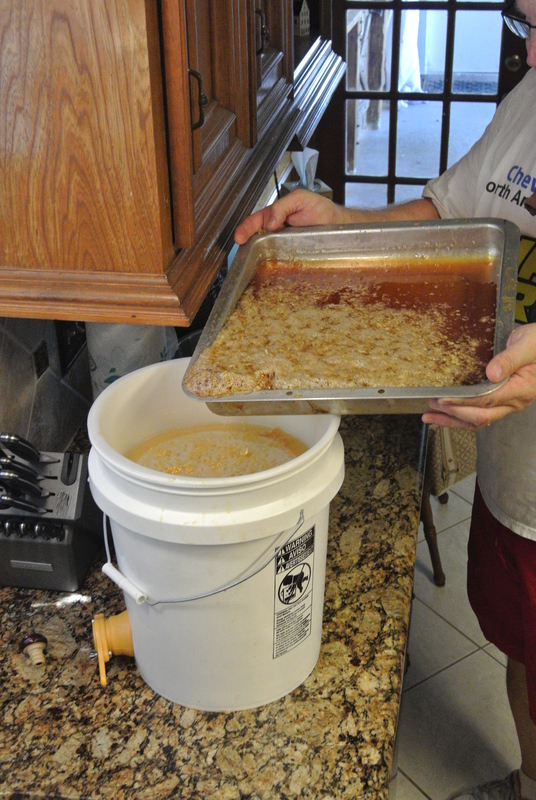 About two gallons of honey, 22 pounds was the result. 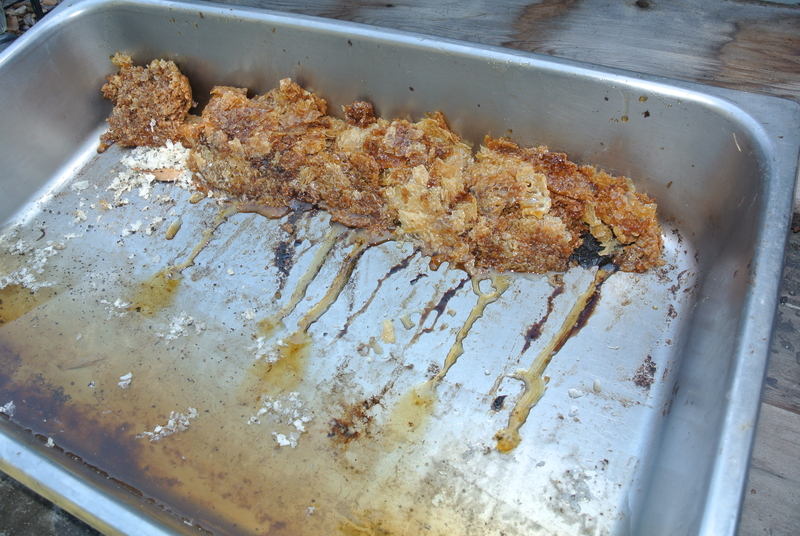 I am using my solar “melter” to separate the wax and residual honey….nice, simple and easy way to do it. The solar box has a glass lid that helps hold the heat! I mash the wax up on the top side of the SS pan. Still a bit of honey oozing out. Tomorrow the wax will be sitting on top of the water. The melting process under the sun’s heat melts the wax, drops out the trash as it drifts down to the water as relatively clean wax. I will later melt and filter it again through cheese cloth. 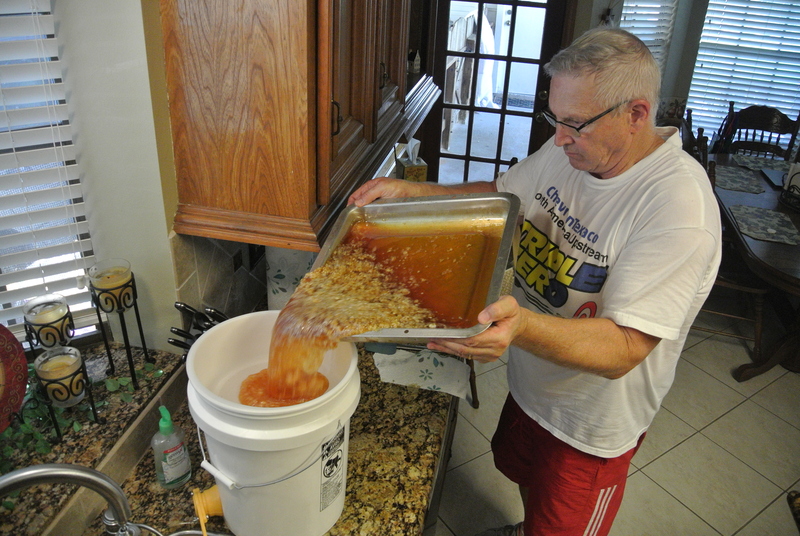 Busy day today….I also transferred my Session India Pale Ale into the secondary fermenter. I added an ounce of Amarillo and an ounce of Simcoe hops……”dry hopping”. Should be amazing once finished. In a few days I will drop the temperature down to 34 degrees to get all the goodies to settle and bottle it. Can’t wait, but I will. Next up a beer using my honey as a component.